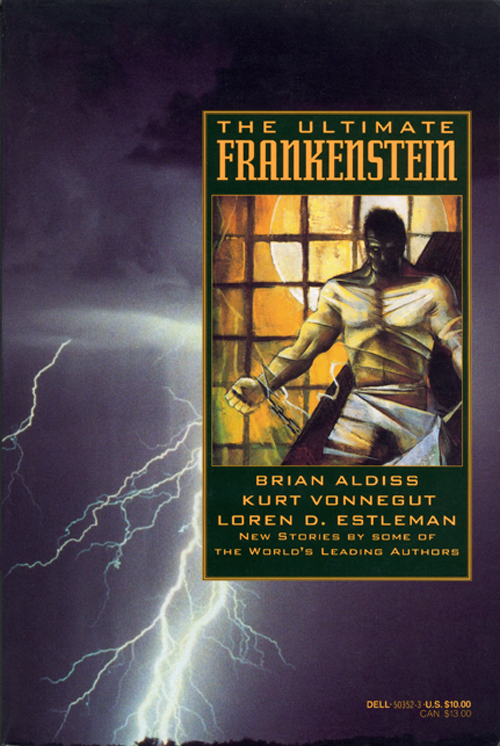 From 1991, a Frankenstein-themed anthology commissioned, edited and packaged by Byron Preiss for Dell Publishing. The cover art is by Bruce Jensen. The Ultimate Frankenstein features superb scratchboard-style chapter headings by C.B. Mordan (of which three are reproduced here, just to give you a taste). An above average collection, the lesser of the nineteen stories here are the body parts horror stories with O’Henry twists whose predictable punch elicit little surprise, and a few “You are the Monster” variations that are, by now, too familiar to Frankenstein fans. Exceptions to these are Chu Chai, a harrowing body part tale about a man obsessed with finding his lover piece by piece, her parts having been redistributed, and Evil, Be My Good, by Philip Jose Farmer, in which The Monster writes to Dr. Waldman (Victor Frankenstein’s mentor) revealing his identity and giving him a gripping, first-hand account of his travails. It is a fine riff playing off both the Mary Shelley novel and the classic movie themes. The best stories are the mood pieces, the stories that reflect on the themes and characters in Frankenstein. One of the best, This Icy Region My Heart Encircles, by Steve Rasmic Tem and Melanie Tem, deals with the final hours of Mary Shelley’s life and the evocative power exerted by her dead husband’s heart that survived cremation and was given to her as a keepsake. In her last moments, Mary is visited by the ghosts of her mother, her children, and that of her creation. In a similar vein, Karen Haber’s Victor finds the creator at the end of his life, lost in the arctic wilderness. The story recaps the novel in a few short pages, in beautiful language… “Sinews like pink chords, like the strings of an instrument. Pluck them and they echo the theme of life”… And Victor’s anguish and rage for revenge is expressed: “William, Justine, Elizabeth. Bones rattling in cold boxes. Specters ‘round my bed. He has killed you all. Driven a dagger at my heart through you”. There’s also one good, rollicking homage to the classic monsters here that fairly pops off the page. Last Call for the Sons of Shock, by David J. Schow, lets us in on the secret annual meeting of Frankenstein’s Monster, Dracula and The Wolfman. Frank is a barkeep and bouncer, Dracula is a jet set entrepreneur, and Larry is a wrestling superstar. You can feel and share Schow’s love for the monster icons. The Ultimate Frankenstein was part of an “Ultimate”-titled series that included collections devoted to Dracula, Werewolf, Mummy and Zombie. The book is easily available through Amazon resellers, or Abebooks. Ha, I just flipped thru a copy of this a couple days ago in a used bookstore but didn't buy it. Thanks for the heads-up. The Tem and Schow stories sound really worthwhile. Always fun to read Schow's reimaginings of classic movie monsters. Yeah, Schow is always a good read. It's a good collection and Preiss was always someone who put together good, well designed packages. I read the Ultimate Zombie when it first came out and thought it was half good, half so-so. This Frankenstein book sounds better though, thanks for the reminder! Have you checked out any of the Dark Horse paperbacks yet like Shadow of Frankenstein or Pandora's Bride? I read the Black Lagoon book and it was pretty good, about half way through Hunter's Moon now and enjoying it. I'm reading Pandora's Bride as we speak. Its really, really good so far. Will report on it down the line.